The recent work “Psychedelic Gedankenexperiment” is a declaration claiming the psychoactive event of lysergic acid diethylamide (LSD) as a “found performance” and as “the art experience par excellence.” The claim is expanded upon, suggesting that over time it will be heralded as the most influential work of art of all time. 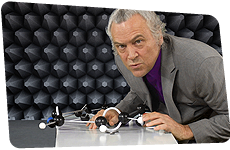 The artist's “performance” takes place in an anechoic chamber which has been computer generated. The entire work is performed backwards, including both movement and speech, which has then been reversed to “correct” it into a comprehensible form. It’s important to note that this is actually the vocalization of sounds that when reversed are revealed as the text in comprehensible form. In his early piece, “Electronic Linguistic”, Hill explores the structural and organic interrelationship of linguistic and electronic phenomena. 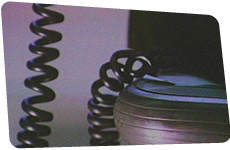 Initially, small pulsating pixel structures occasionally appear on the black screen. These monadic forms become larger, ultimately filling the picture plane and pulsating ever more intensely. Through its construction of a language of electronic images and sound, this work prefigures later, more complex pieces. 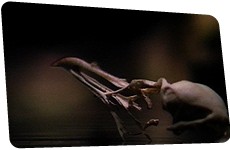 One of the earlier works, “Elements”, Hill produced on the Rutt / Etra video synthesizer, Elements combines abstract “landscapes” with fragmented syllabic language. Undulating topological forms superimpose themselves on one another, changing their shape and direction of movement. The nature of the image constantly shifts from what could be microscopic forms to what may be aerial views of impenetrable-looking networks that gradually fall into place before one’s eyes. At the same time, one hears syllabic fragments of the words "earth", "fire", "water" and "air" that, although abstract, give the work a rhythmic pulse that converges with the rhythm of the visual elements. 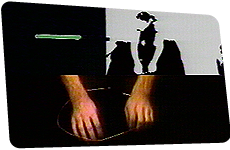 In “Full Circle”, the audio-visual dialogue that was a central concern of Hill’s videos in the late 1970’s is articulated with particular succinctness. Here the artist explores linguistic and electronic phenomena by linking them to the materiality of things. The image plane is divided into three sections. 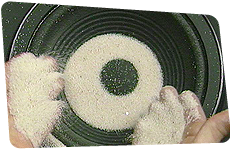 In the lower half, we see a close-up of two hands that are forming a circle out of a metal rod. 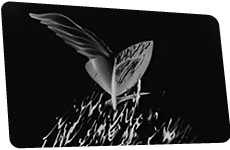 On the right, the outlines of the person bending the rod can be made out from an electronically altered black-and-white video image. 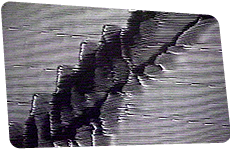 On the left, a green beam appears in a black field (screen of an oscilloscope). The work begins with the artist making a droning sound with his voice that changes the green beam into a wavering circle. The steadier the sound made by Hill, the steadier the circle becomes. Thus making the work into a kind of ritual performance. “Around & About” came out of a “what if” scenario. What if image could be cut images to every syllable of a spoken text? Gary Hill: "I did it all manually, hitting the edit button for every syllable. With each rewind I would listen and anticipate the coming syllable, learning as I went along to adjust for delayed reaction. Rather than separately recording and collecting images, I set the cameras up ‘live’ for each edit/syllable of the entire text, constructing it linearly from beginning to end. I limited myself to images of the room, mostly unmemorable moments of walls, furniture, and whatever else was lying around. It didn’t really matter; it was more about change and keeping the viewer occupied while I spoke. The speech was ‘automating’ the event, making whatever happened happen, at times drawing the view off the screen to the hypothetical space outside the box". “Mediations (towards a remake of Soundings)” (1979 / 1986, 4'17'') — the beginning of a remake of an earlier work (“Soundings”, 1979) in which could be extended the reflexivity of each text in relation to the interaction between different physical substances — in this case, sand — and the speaker cone. A loudspeaker fills the screen and I begin to speak, referring to the speaker itself. 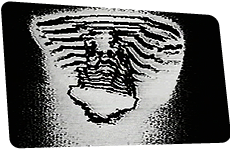 A hand filled with sand enters the picture and slowly releases it into the loudspeaker’s cone. Every nuance of speech vibrates the speaker’s cone (or membrane), bouncing the grains of sand into the air. The more I speak about what is happening, the more it changes—or feeds back into—the movement and patterns of the sand. When the speaker is completely buried, the voice sounds distant but remarkably clear. In “Happenstance (part one of many parts)” Hill is creating a kind of choreography of thought, gives rise to an area of tension between the images and the spoken or written texts. At the textual level, he addresses the ephemerality of linguistic meanings inside the ‘nature’ of language. Musical and sound elements underscore the character of the individual passages and the complex intertextuality of the work. The opening sequence of this black-and-white work shows the square, circle and triangle as the basic elements of the formal repertoire. They are joined by letters and words, whose configuration suggests the shape of the triangle. Simultaneously sounds are linked to the visual elements: a bass drum to the square, crash cymbal to the circle and a kind of ‘twang’ sound to the triangle. The “reader” begins in the liquidity of the text almost as if he were waking from drowning. Images of the sea ravishing the shore — small cliffs of sand eroding and collapsing — are inter-cut with extreme close-ups of text and the texture of the page and book itself being flooded with ocean waves. 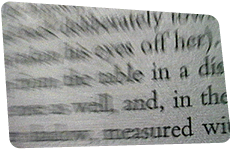 In scene after scene the reader attempts to re-enter the book only to find himself a part of intense dreams and hallucinations. Thomas/Hill reads the book, when, suddenly, he feels he is being watched by the words. The text infiltrates the reader’s entire experience. The final scene shows the reader in the form of Hill physically and mentally destroyed. Cowering naked in the fetal position, he lies in his own excrement on a white-tiled floor, babbling unintelligible sounds. The pages of the book have grown into monumental walls with colossal letters that menacingly surround and imprison the naked body. In “Site Recite” appearing as a hazy horizon laden with strange objects, the scene comprises bones, skulls of small mammals, butterflies, nuts, and other botanical “finds” spread out on a round table.